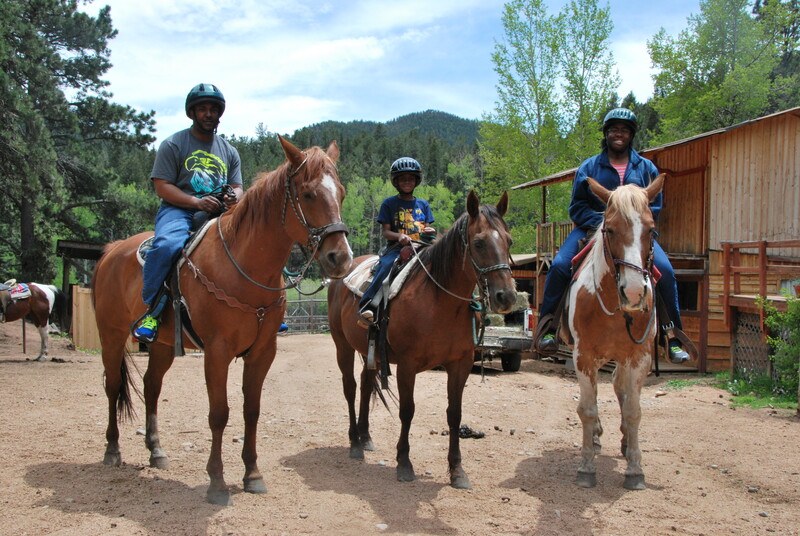 With the help of a supporter, Freedom Alliance was able to set up an hour-long horse ride around Colorado’s Cheyenne Mountain for a very special family. Air Force medic Eunice is dealing with muscle deterioration, which affects her balance, and must walk with a cane. But before her handicap, she deployed overseas with an Army tanker unit, where she saw lots of casualties. Her husband, Cyril, still pilots for the Air Force, many times flying home the bodies of fallen soldiers. Since this couple has undergone so much trauma, and because of Eunice’s condition, we thought Western horseback riding was just the thing to allow her and her family to be together and active outdoors. This was a new experience for them, and their first ride was peaceful and scenic. The Stables at the Broadmoor, in Colorado’s Pike National Forest, is set up like an Old West town, with antique-style structures lining the ranch, as well as an old stage coach, so that a visit here is like stepping back in time. From on horseback, the woodland trail is captivating and the mountain vistas can’t be topped.